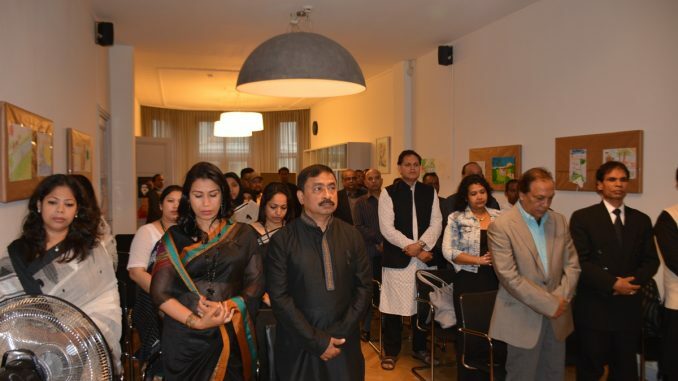 The Ambassador of Bangladesh to the Netherlands Sheikh Mohammed Belal urged all to be part of nation building through engaging in a new kind of liberation war for realising what Father of the Nation Bangabandhu dreamt in his vision “Sonar Bangla”. 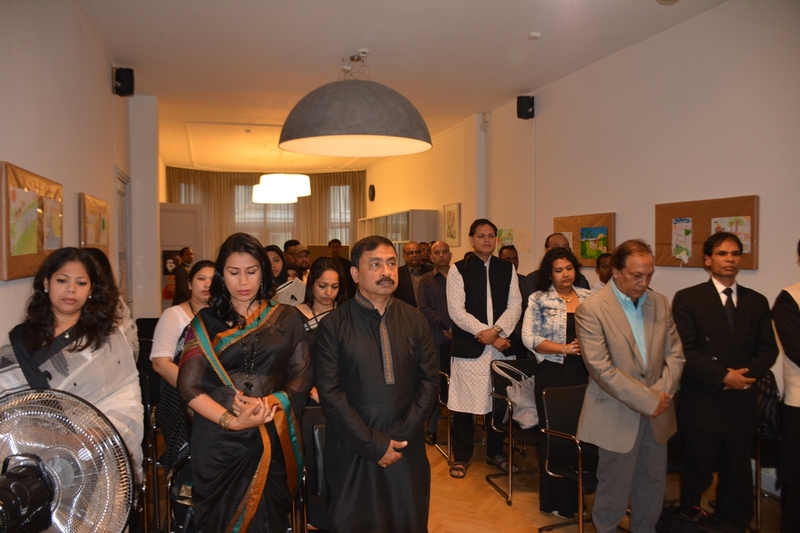 The Embassy of Bangladesh in The Hague, Netherlands observed the 42nd martyrdom anniversary of the Father of the Nation, Bangabandhu Sheikh Mujibur Rahman and the National Mourning Day, today, the 15th August 2017, at the chancery with due reverence and solemnity. Speakers on the occasion reiterated the demand for bringing in the killers of Bangabandhu, who are still absconding, to execute the court verdict. The programme of the day commenced by keeping the National Flag half-mast at the chancery premises. The programme started with the recitation from the Holy scriptures. All stood in solemn silence to pay homage to the departed soul of Bangabandhu Sheikh Mujibur Rahman, the members of his family and the other martyrs. The messages issued by Hon’ble President, Hon’ble Prime Minister, Hon’ble Foreign Minister and Hon’ble State Minister for Foreign Affairs were read out. 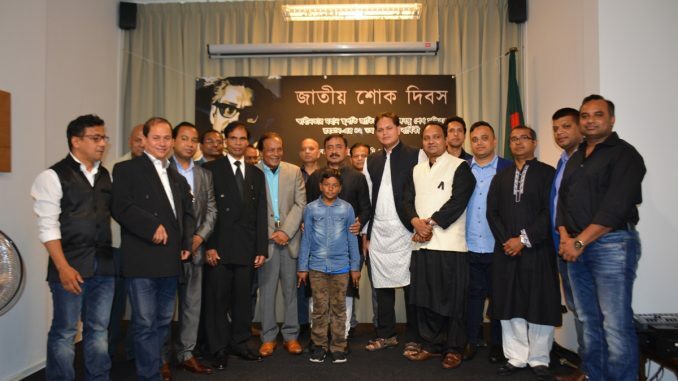 As an initiative to transmit Bangabandhu’s spirit of patriotism and sacrifice to the members of the future generations, a speech session of the young was arranged. School going students Obontika Shaha Shaha, Farin Zunaina Preema and Ilmaa Zarifah Ahmed participated in the event. To the surprise of the present audience they have nicely presented how they look at a towering personality like Bangabandhu and how they embrace him as their role model. As part of programme, a discussion meeting was arranged to highlight the life-long sacrifice of Bangabandhu. During the discussion, the speakers deliberated on the significance of the National Mourning Day. The speakers paid deep tribute to the Father of the Nation, the architect of the country’s independence Bangabandhu Sheikh Mujibur Rahman. Dignified member of the community Mr. Babul recited a poem recited by himself while Mr. Bikash Roy spoke on the occasion. 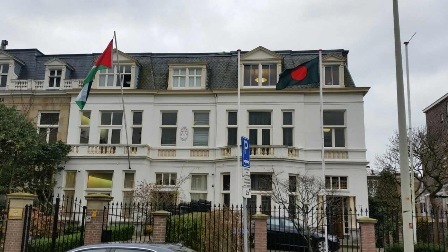 Netherlands Awami League leaders Mr. Mayeed Faruque, Mr. Shahadat Hossain Tapan, Mr. Mustafa Zaman, Mr. Murad Khan, Mr. Jainal Abedin recalled the memories of Bangabandhu and urged all to work together under the able leadership of Prime Minister Sheikh Hasina. All of them demanded immediate extradition of the absconding killers of Bangabandhu for execution of the court verdict. 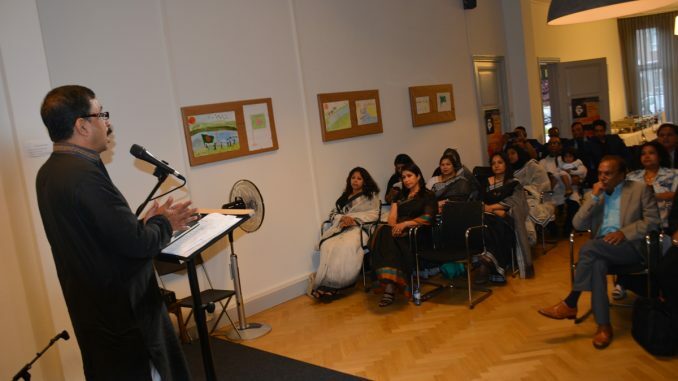 The Ambassador in his speech highlighted various aspects of the life of the Father of the Nation Bangabandhu Sheikh Mujibur Rahman and his contribution for the nation. Ambassador Belal Said that great personalities like Bangabandhu do not have death rather they are always alive in the hearts of the people. Ambassador, regretting his chance of not being there as a freedom fighter during our war of liberation, promised to dedicate each of his day for another kind of struggle to realise the dream of Father of the Nation Bangabandhu Sheikh Mujibur Rahman. Recalling the visit of Honble Prime Minister Sheikh Hasina to the Netherlands for an official visit in November 2015, Ambassador elaborated on the activities of the embassy to complement her vision 2021 as well as laying stepping stone for the vision 2041. The Ambassador cited the example of the Netherlands on how they transformed their biggest threat i.e. water to be their biggest strength and narrated how Hon’ble Prime Minister captured world’s attention through her inclusion as one of the eleven statesmen of the world by the former Secretary General of the United Nations in his High Level Panel for Water. Referring to lessons learned from the Dutch successes in the water and other innovations, Ambassador Belal also took pride in the achievement of the Digital Bangladesh and highlighted the ongoing development spree in the country. He cited the concept of “Brain port-Eindhoven” and urged to apply the same concept in Bangladesh for further advancement in ICT under Digital Bangladesh vision. Ambassador Belal urged all NRBs to complement the ongoing development work through sustaining the progressive Bengalee nationalism for which Bangabandhu worked though out his life. After the discussion, a special prayer (munajat) was offered seeking divine mercy and peace for the salvation of the departed soul of Bangabandhu Sheikh Mujibur Rahman and his martyred family members and for continued peace, progress and prosperity of our motherland. 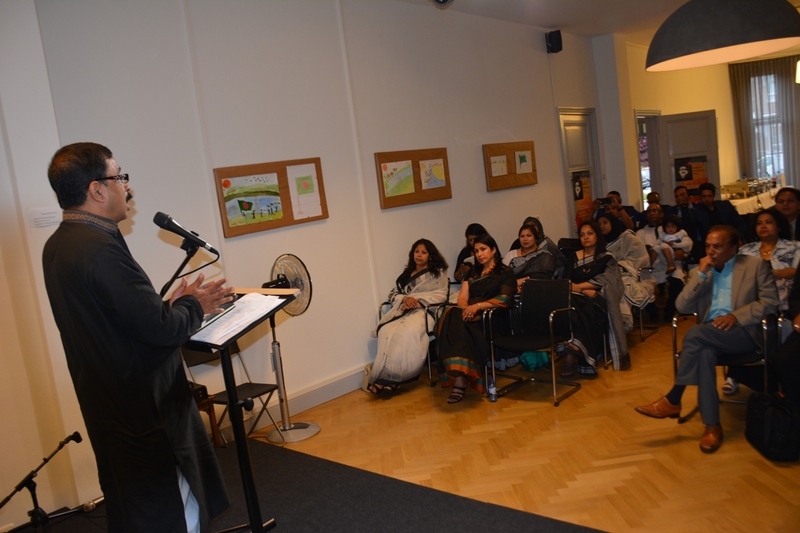 Although the event took place during a working day amidst inclement weather, a room full of audience watched with awe the life and ideals of Bangabandhu as embassy screened a documentary on Bangabandhu.